These are the questions that we get asked the most. Q: How far is the home from the airport? Q: How and where do we get our keys to the property? Q: How do I get to your home? Q: When we rent this house, how do we know where the house is & how to get there? Q: Is the neighbourhood safe? Q: What sort of temperature can we expect? Q: What is there to do if it rains? Q: If we need the pool heated after we arrive can it be turned on? Q: Do you supply towels for the home? Q: What happens if we damage or break something? Q: Who looks after the property and pool etc? Q: What should we do if we are lost? Q: How will we pay for the pool heating if the pool is switched on after we arrive? Q: What do we do with the keys to the home at the end of our vacation? A: We offer discounts on bookings over 14 nights. A: The travelling time from Orlando International Airport is approx. 40 minutes, as always it will depend on the time of your arrival and the traffic. A: We operate a keyless entry lock system. This just needs a code number that we will supply before your arrival. If this fails, then keys can be obtained from the management company. Full details of which will be supplied before your stay. A: Directions to the management company will be E-Mailed to you on completion of your booking. After checking in, they will give you your instructions to your home. Q: When we rent this house, how do we know where the house is and how to get there? A: Upon booking your stay, and, upon receipt of the Deposit, you will be sent instructions and directions, to the Management Company, which is approximately a 30 minute drive from Orlando airport (a very simple route) and it is on the way to Emerald Island. They will give you your keys and directions to your home. A: Our home is fully furnished and includes all amenities, including linens and towels. You only need to bring clothing and personal hygiene items. Bring some beach towels for the beach or water parks. A: YES most definately! 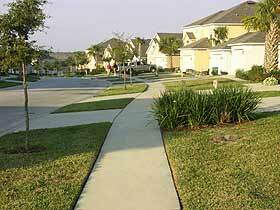 Despite the huge numbers of tourists arriving in the Orlando and Kissimmee area, this is a safe neighbourhood. Of course it would be silly not to take precautions, like keeping the home door locked when you all leave. We think that you will find Emerald Island Resort relaxing, trouble free, safe and secure, day and night. A: If it rains, you can either enjoy the facilities at your home or the club house. If you have some money left, go shopping, you are spoilt for choice! A: No! If stays are less than 7 nights, there is an additional one off charge for the extra cleaning of £50 / $75. This will be added to the rental. A: Yes. For an additional charge the pool heat will be turned-on. Keep in mind that the pool faces south, so you'll have sun all day long, even in the winter. Heat is not needed normally during the months of April through October. A pool blanket is provided and we request, that this is used to help retain the heat when the pool is not in use, this also helps when heating the pool. Q: If we need the pool heated after we arrive, can it be turned on? A: The management company will not turn the pool heating on without our permission. Therfore, if you think you may need the pool heated, please let us know beforehand, so we can inform the management company. A: The pool is 3 feet (0.9m) at the shallow end and 5½ feet (1.6m) at the deep end. Q: What happens if we have any problems or questions during our stay? A: We have a local management company on call 24/7 to take care of you. Their contact information will be E-Mailed to you on receipt of your Deposit. A: We supply both hand and bath towels for all three bathrooms. We also supply pool towels for the pool area, enough for ten people. A: We understand that accidents do happen. Before each guest arrives, our management company will inspect our home and have an inventory and list of information regarding your rental home. If you break something, we expect you to report it to the management company, so they can resolve the problem during your stay. If you do not report this, and our cleaning personnel discover damage after you leave, we may then have to use your deposit to pay for this damage. We ask you to be honest and report any damage to our management company. Depending on what the damage is, you may even not be charged. A: The property is maintained by our management company. During your stay, don't be alarmed if someone calls to clean the pool or cut the grass etc. If there is a problem, their telephone number is in the folder provided. A: There is a Publix supermarket about 1 mile drive from the entrance of Emerald Island. Nearer still is a large supermarket at Formosa Gardens which is a little more expensive than the Publix. A: If you are lost the best thing to do is find the nearest petrol station and ask for directions. A: If your stay is less than 7 days, we will take the cost out of your security deposit. More than 7 days you will have to pay the management company the total amount. A: We operate a keyless entry system. If the keyless entry lock fails, then you would have been supplied keys from the management company. Simply return them to the management company after your stay.